Marshall J Brown Co is a distinguished duplex basket strainer supplier for many commercial and industrial applications., We will provide you with expert knowledge and high-quality products this time and every time you contact us. Duplex basket strainers are designed for applications that demand continuous flow with a minimal loss of pressure. 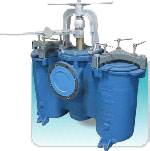 Duplex strainers are designed to resist harsh industrial chemicals, see more on FRP strainers. You can count on Marshall J Brown to deliver superior duplex basket strainers because we understand how crucial it is for pumps and compressors to be protected in pipeline systems. Marshall J Brown Co offers a variety of duplex basket strainer styles to best suit your application, including tri ball duplex strainers and more. In need of duplex basket strainers? Let Marshall J Brown be your industrial strainer supplier – Contact us today!